Despite what modern cosmetics ads may want us to believe, men are wearing makeup and are damn proud of it. A little makeup can go a long way toward accentuating your best features and hiding flaws. Too much makeup, though, and you risk looking “made-up”. The key to applying your makeup is striking the balance between how much you use and where you use it. The following seven makeup tips, tricks and hacks go out to all the guys who know their liner from their stick, and to all those who are just starting out. DIFFERIO, New York menswear online shopping store doesn’t sell only trendy mens clothing, but it has the largest variety of mens makeup products designed to make every man feel more confident in his own skin. From darkening eyes to sharpening jawlines, men’s makeup not only perfects your complexion, but also enhances your most masculine features. Our makeup for men features the essentials for achieving a flawless face with a natural finish. Browse our professional men makeup collection of foundation for men, manscara, concealer for men, guyliner, and much more. Our male makeup tools are quick and easy to use for the most practical application. Now you can easily make mens makeup an indispensable part of your morning routine without anyone discovering your secret. Exfoliate. Wash your face with a gentle exfoliant, and rub slowly in a circular motion with warm water to remove dead skin cells. Rinse and pat (don’t rub) dry with a towel. Moisturize. Apply moisturizer with a sunscreen that has an SPF of 15 or higher to your face and neck. Allow the moisturizer to absorb into your skin before proceeding to the next step. Wet a cosmetic pad or cotton ball with toner, and pat it lightly on your skin. Toner is meant to restore the skin to its natural pH level and remove any remaining dirt or dry skin cells. Note that if you’re going to do this step, it’s best to be clean-shaven – little bits of makeup will really stick out on stubble. 1. How to contour properly. Contouring and highlighting are two crafty techniques that can enhance your best features. They can define your cheekbones, even out your skin, give you a natural glow and even create the illusion of a slimmer nose. Fair warning: when done wrong, the results can be downright disastrous. Luckily, makeup expert Wayne Goss, best known for his useful makeup tutorials on looking “flawless, not fake,” has created this helpful how-to video on mastering the art of contouring and highlighting. 2. How to conceal under-eye circles and redness. Hide dark circles. Using small strokes, apply concealer under your lower lashes and between the inner corner of your eyes and your nose. Let it dry halfway, then use your fingers to rub it in. Conceal blemishes by going around the base of the blemish in small strokes, then covering the top. Make sure the edges are blended well. Concealer for Men by NU Makeup. No one will know your spotless skin secret with this concealer for men. This concealer stick is small, but unbelievably mighty. Developed with an exclusive cream-to-powder formula that applies like a smooth cream with the natural finish of a powder. Apply concealer for men on desired areas of the face to hide scars, acne, wrinkles, and other imperfections. Sleek stick applicator for quick and easy application specifically designed to conceal on men’s skin. Concealer for men will keep you looking flawless from cheek to cheek. Available in 3 shades. 3. How to fake a thicker beard. In less than three minutes, fashion vlogger Colin Jay explains how to turn a thin, patchy beard into a fuller, darker one. The trick? NYX eyebrow cake powder. The technique is ideal for covering up shaving mistakes or areas that are sparse on your face. 4. How to trim, shape and groom eyebrows. To help your brows look their best, you’ll need three things: a good pair of tweezers, brow pencil and brow gel. Vlogger Jake-Jamie Ward, a.k.a the Beauty Boy, explains how to achieve the perfect brow shape and how to correctly use brow pencils and brow gels. Pro tip: pluck with discretion. 5. How to apply guyliner. From Johnny Depp to Jared Leto, we’ve seen several male celebs rockin’ guyliner. To recreate, you’ll need black eyeliner, eyeshadow and mascara. In a few simple steps, English makeup artist Wayne Goss discusses how to perfect the look. Apply liquid base foundation (optional). If you have a lot of area to cover, find a liquid foundation that’s as close as possible to your natural skin tone. Use your fingers or a cosmetic sponge to apply a light layer all over your face. 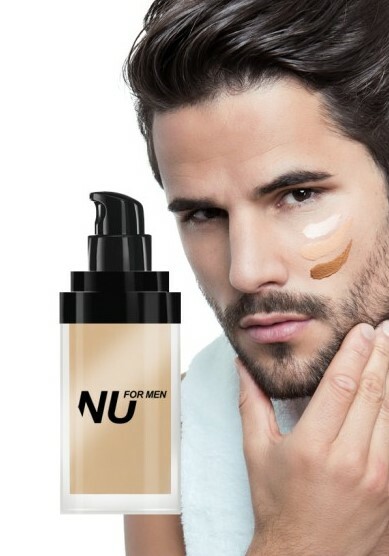 Liquid Foundation for Men by NU Makeup. Give your skin the ultimate radiant finish with liquid foundation for men. Featuring a lightweight, non-comedogenic foundation that provides maximum coverage for blemishes and imperfections. Formulated with the benefits of vitamins and antioxidants ideal for sensitive skin. Liquid foundation for men easily blends into skin while hydrating for a super smooth finish. For best results, apply foundation with makeup blender or brush, and blend well into skin. Look instantly rejuvenated with liquid foundation for men for a naturally flawless complexion. Available in 4 colors. Manscara Black by NU Makeup. Introducing black waterproof manscara designed to enhance men’s lashes to the fullest. Featuring vitamin rich formula loaded with botanical extracts. Designed with tapered silicone wand that extends and volumizes lashes up to 60%. Black manscara instantly lifts lashes without clumping. Gently sweep brush along lashes from root to tip for an eye-opening look. Includes flattering black shade to amplify lashes with an undetectable finish. Take your eye makeup to unstoppable lengths with waterproof manscara. 8. How to get soft lips. Lip care can often be overlooked. Ross Callahan, self proclaimed “YouTube’s number one male skin care and grooming guru,” recommends using a lip balm with SPF daily. Learn how to pick the right lip balm and how to exfoliate your lips in the tutorial below. 9. Commit to a daily skin care routine. It’s important for makeup wearers to stay committed to their skin care regimen. Any guy who wears makeup should be aware of the benefits of using cleanser, toner and moisturizer on a daily basis. Learn the essentials with this instructional video by James Welsh, a men’s grooming, style and hair vlogger. « NEW SOLUTION FOR MAINTAINING SALON PERFECT CURLS!